This kit includes all the epoxy and fiberglass listed in our Bill Of Materials for the FS14 Low sheer boat plan, along with the complete CNC Kit. [FS17] Fast Skiff 17: easy to build but able vee hull. [FS18] Flats Stalker: a easy to pole, narrow beam flats fishing skiff. [FS19] Fast Skiff 19: easy to build but able vee hull. This is the larger version of our FS17. This kit includes all the epoxy and fiberglass listed in our Bill Of Materials for the FS19 boat plan. [GF14] A simple and economical 14' flat bottom garvey: jon boat, duck boat. Fast with small outboards, very stable, easy to build, sturdy. Can be made unsinkable. [GF16] A simple and economical 16' flat bottom garvey: jon boat, duck boat. Fast with small outboards, very stable, easy to build, sturdy. Can be made unsinkable. [GP21] General Purpose 21' hull, several options to choose from: Work Boat, Tour Boat, Bass Boat, Deck Boat, and Center Console, as well as the Basic model. 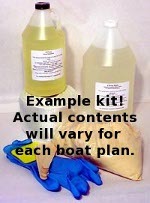 This kit includes all the epoxy and fiberglass listed in our Bill Of Materials for the GP21 boat plan.